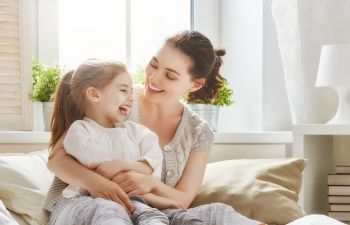 If you are raising young children, we know that your job can be difficult, especially when it comes to bedtime routines. As you pick your battles, however, we encourage you to fight for their oral health. Brushing and flossing can be a source of dread for many parents, as kids may try to rush through the task or skip it altogether. The truth is, promoting good dental hygiene habits in your child is one of the most important parenting jobs you’ll have. Their oral health can impact their well-being as well as their overall health. Most of all, diligent dental care habits as a child almost always carry over into adulthood. What child doesn’t love brand-new shiny things to use? When it comes to oral care tools and products, there are endless options to excite your child, ranging from cartoon themed toothbrushes, colorful handheld flossers and even cool spin brushes to make the job both easy and fun. Consider taking your child with you to the store to pick out a favorite oral care product. You know your child best. What motivates your child to succeed? Is it special privileges such as more screen time, a fun ice cream outing with a friend or a new toy they’ve had their eye on? Consider making a reward or sticker chart for your child and set a goal for how many times they brush and floss on their own in a week or month, then reward them at the end with what you know they’ll work hard for. One of the best ways you can encourage good brushing and flossing habits in your kids is to let them see you doing the tasks at home. As their primary caregiver and role model, try brushing alongside your child and letting them mimic your actions. This is a great time to explain why it is important to clean our teeth every day. Some children simply need to see the hard evidence of why brushing and flossing is necessary. If this sounds familiar, consider purchasing a “plaque test.” These include special tablets that instantly show your child areas that need better cleaning! As your child’s dentist, we can provide professional cleanings, x-rays, sealants and other preventative care treatments. We can also discuss proper oral hygiene with your child as an authority figure in the field. However, we only see your child 2 days out of the year. How your child takes care of his or her teeth at home for the other 363 days can make the most impact. For more tips on how to encourage optimal oral health in your children, please contact Gainesville Dental Group. We offer superior dental care for the entire family!